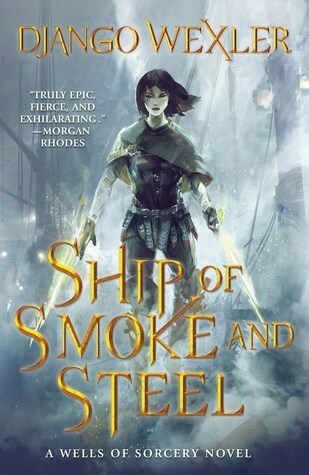 I am not going to lie when I say that when seeing the cover I got a Throne of Glass sense and then when reading the synopsis I got a Blackhearts vibe. How about you? Well whatever bribe you might have been receiving, I was excited to set sail. Django Wexler writes a story that follows a tremendously strong heroine who is sent on a mission in exchange for her sisters safety. Her first couple of weeks on the ship are not meant with the easiest of welcomes and she is sent on missions to stop the destruction of the ship by different sea crabs and other sea creatures. What is most great is that throughout the story we see this young woman who has this drive to do everything she can to get her sister back. By challenging shipmates to going on what seems as impossible and deadly missions to potentially finding a way to save the entire crew, Isoka is a person one must not doubt or lose faith in. I do have to admit that compared to most fantasy reads, this one did take me a little bit longer than normally. It wasn't that I wasn't liking the story but that the way it was written was different. There was this continuous buildup/action scene throughout that in a way made it seem more exciting. The story would fill you in on relevant information and then BAM, hit you with some fighting action. Django Wexler is definitely a storyteller I have come to enjoy through this one read. I am looking forward to continue the story and see if Isoka will be successful in commandeering the ship and rescuing her sister. Ship of Smoke and Steel is a fantastic fantasy read that will pull you in and take you forth on an adventure. A sea-worthy read!